As media now seep into nearly every part of our lives, a group of Vassar professors — representing various departments and interests — is collaborating with students and administrators on the Media Studies Development Project (MSDP), an effort to establish a program major that approaches the study of media in a multidisciplinary manner. Although the group is still forming the intellectual and organizational foundations of the media studies program, momentum is indisputably building. Over the summer, students remained on campus to work with professors at the Media Studies Summer Institute; and this semester, the first media studies course, Approaches to Media Studies, is filled to capacity. 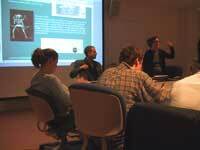 Professors Mark Lipton (anthropology) and Lisa Brawley (urban studies) team teach Approaches to Media Studies. "The student interest in media studies is clearly very high. Every course dealing with ‘media’ generates a lot of interest," said Thomas Porcello, co-director of the MSDP and assistant professor of anthropology. "And although there are 40 to 50 regularly taught courses with fairly significant media content, there is no central place to make the obvious connections between them." Students in different departments work to concentrate in media studies (albeit unofficially) every year, through carefully chosen courses, advisers, and thesis topics. Those enrolled in the new media studies course, in fact, are majoring in departments ranging from urban studies and political science to biopsychology and English. One student in the class, drama major Amanda Wallwin ’02, said she enrolled in the course to combine her own interests in theater and technology. Kate Wood ’02, a sociology major by default (she said she would have liked to have been a media studies major), is the MSDP’s student intern. 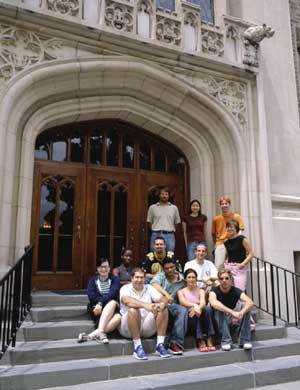 She believes that media studies will be exceedingly popular at Vassar. "As a culture, we are increasingly mediated, and at the same time we are increasingly concerned with the media," she said. "The kinds of issues examined within media studies are extremely pertinent to the way we live today, and I think that many students will want to take on these kinds of questions." Although media have more recently expanded in technological advancement and societal impact, the idea of critically studying media is not new to Vassar. Helen D. Lockwood ’12, former professor of English and founder of Vassar’s Program in American Culture, invented an early version of media studies during her long tenure at Vassar (1927–1956). According to a 1952 college catalogue, Lockwood’s Contemporary Press course was a seniors-only offering in the English department that focused on the "philosophy of free speech and communicating today’s world." This long history and student demand, along with the current global shift toward a more highly mediated society, makes formal media studies programs seem like a natural progression in higher education. Seven of Vassar’s peer institutions — Carleton, Connecticut, Hamilton, Macalester, Pomona, and Swarthmore Colleges, and Washington and Lee University — offer some type of media studies program. Nevertheless, Vassar’s MSDP has faced many challenges in creating this new path of study — the largest being to clarify and define "media," according to William Hoynes, professor of sociology, co-director of the MSDP, and director of the Media Studies Summer Institute. The MSDP is working to ensure that the program’s purpose and offerings derive from a diverse combination of disciplines, departments, and perspectives. "We’re all cautious [about doing] this slowly and carefully," said Hoynes. "Faculty time has been invested in conversations of theories, concepts, research methods, and the roles of practices connected to media.… Rather than have a fixed definition, the multidisciplinary nature of this initiative is likely to continually foreground the various theoretical frameworks, methodologies, and definitional questions surrounding the study of ‘media,’" Hoynes said. Film major Brainerd Taylor ’02, who participated in the summer institute as a media scholar, believes a media studies program could not work in any other way. "Media studies will requisitely remain multidisciplinary [because] its breadth is [so] great," he said. "And that’s a good thing." His classmate Wood agreed, she said that neither students nor professors can adequately address media studies while wearing "disciplinary blinders." Those involved in defining the MSDP are strongly dedicated to the challenging task of constructing a program that stays true to Vassar’s educational mission. Professors Hoynes and Porcello emphasize the importance of keeping media studies within the liberal arts framework, rather than allowing it to become a vocational course of study for those who want to enter the field of journalism. "We are not basing our program on any other school’s. We are trying to build a distinctively Vassar media studies program that builds on and extends our existing curricular strengths," Hoynes said. ChyChy Ezeh ’02, a science, technology, and society major (who, like Wood, would have liked the opportunity to declare a media studies major) said Vassar administrators, faculty, and trustees need to push harder for such a program — one that allows students "to apply both theory and practice in the real world," and thereby does not "detract from the liberal arts experience." The Media Studies Summer Institute, which was partly funded by the college’s Mellon Foundation grants, attempted to tackle some of these major issues. Eleven students worked full-time on projects with professors; they also completed individual multimedia research and a collective design project. Four of the students were selected from Vassar’s Center for Electronic Learning and Teaching (CELT) as "student mentors" to train the others in digital media production and design; six (chosen from over 40 applicants) were there as "media scholars," representing different academic backgrounds; and Wood participated as the media studies intern. 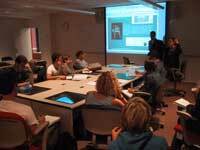 Participants worked in the library’s new Media Cloisters (at right) with state-of-the-art technology to assist them. Their projects ranged from creating Webcasts of WVKR radio shows, databases of sound recording technologies, and a promotional film for a Vassar grad’s New York City stage production to assisting with the conception of a syllabus for the first media studies course. Professor Hoynes said that these collaborative projects were meant to connect the students with each other and to faculty members in an innovative manner. While interest in the MSDP continues to expand and intensify, there is no planned date for tagging media studies a new major at Vassar. "We have the student and faculty interest as well as the support of the dean of the faculty’s office, and we all agree that this is a curricular direction worth exploring," Hoynes said. "But the timing depends on the resources." MSDP co-director Porcello said that the most pressing need is for the program to obtain a stable financial base that will guarantee professors’ availability to offer regular courses. Support for funding is growing, he said, but it’ll likely be another three to five years before the program obtains "major" status. Classroom photos by Scott Murray '01. Summer Institute and Media Cloisters photos by Will Faller.